Huang Jian slowly turned on the stove in Adalio Rio's kitchen which immediately produced a long bright blue flame. "I thank the government and Chinese experts for their precious help. I'm deeply moved," said Rio, delighted by this new source of clean energy. Huang is one of the Chinese agricultural experts sent by China's Ministry of Agriculture and Rural Affairs to São Tomé and Príncipe. By turning on the switch on November 7, 2018, he inaugurated one of the main achievements of their assistance mission to the archipelago: the official commissioning of the first biogas tank built in the community of Mesquita, Lobata District. Huang is a senior agronomist at the Agricultural Technology Promotion Center in Wangcang County, Sichuan Province in southwest China, where he has garnered years of expertise in rural energy planning and technology demonstration. In 2016, Huang went to Africa for the first time as part of a United Nations-sponsored South-South agricultural cooperation project between China and Uganda. He told ChinAfrica that he was smitten by the continent at first sight and overjoyed to be able to apply his knowledge and expertise to improve the lives of local people. 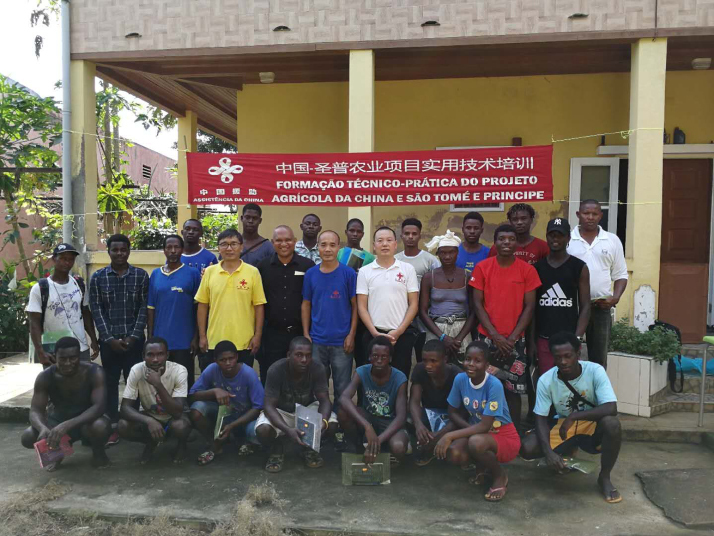 As soon as he returned to China in 2018, he volunteered to join the second group of agricultural experts as part of the Chinese assistance mission to São Tomé and Príncipe. In April, he set foot on the continent again, together with five other experts and two interpreters for a mission of two years. On the ground, Huang quickly realized that local energy sources were extremely scarce, due to the lack of large-scale capacity to exploit oil, natural gas and coal. Local inhabitants mainly rely on wood, which is neither efficient nor environmentally friendly. As an expert in rural energy, Huang was convinced that the most natural and rapid way to address this energy challenge was to build biogas tanks. Biogas, a renewable energy source, is a combustible gas produced through the fermentation of microorganisms in manure in the absence of oxygen. The gas can then be burned to produce energy, while manure residue from the production process can be used as a kind of biological fertilizer for crops. "Building biogas tanks on the archipelago is an effective solution to improve the quality of life of local communities. This will not only improve the overall sanitary environment on the islands, but also provides enough energy to cover the daily needs of the inhabitants," Huang told ChinAfrica. He immediately starting working on planning and preparations, but the first hurdles soon appeared. Huang was initially faced with the problem of choosing an adequate site for the tanks. In order to ensure sufficient biogas production, tanks had to be built near large-scale livestock farms. However, it takes at least 10 50-kg pigs to provide enough manure for a single 8-cubic-meter biogas tank. This is beyond what most local farmers can afford on the archipelago. He then decided to introduce a fuel-efficient stove made in China to help the farmers who do not have enough animals to solve their energy problems. "Compared to conventional stoves on the island, this new type of stove uses 80 percent less firewood. Through its complete combustion of firewood, it will reduce carbon dioxide and smoke emissions and improve the local sanitary environment," explained Huang. The high cost of local materials - particularly cement, stone and sand - was also a challenge. In order to guarantee the quality of building materials, Huang paid frequent visits to the local material market, as well as to brickworks and sandstone factories, to find out more about price trends and ensure that the quality was up to the required standard. Before the arrival of Huang on the archipelago, the first group of Chinese agricultural experts had already managed to build three biogas tanks in São Tomé and Príncipe. This breakthrough also meant that the country is now facing a shortage of technicians and skilled workers in the biogas field. Huang is therefore working to develop technical plans and training materials for local workers. "First of all, I go through each stage of construction with them, and then the workers can follow the technical plan by themselves. If the completed tank does not meet the requirements, it must be modified until it can fully meet technical standards," he said. Ten months after his arrival, Huang finished the construction of three new biogas tanks, much to the local villagers' delight. "Livestock manure is sealed in the tank, where it ferments to produce biogas that is then used to cook food, save firewood and reduce deforestation. This technology is very useful for our country," said Mário Alves De Carvalhodos Santo, one of the local workers on the biogas project. According to Huang, the use of biogas will significantly reduce the financial burden on local farmers. Indeed, a single biogas tank of 6 to 10 cubic meters is enough to meet the daily energy needs of up to 10 people. This is equivalent to firewood from a wooded area of about 2,000 square meters. In addition, since manure is sealed in the tank, it can no longer become the source of disease, which will directly improve the country's health environment. The manure residue also makes excellent organic fertilizer to improve agricultural yield while reducing the use of chemical fertilizers and pesticides. Huang explained that if daily management and maintenance of the tanks comply with technical requirements, a biogas tank can be used for more than 20 years. "By teaching local residents the skills for building and maintaining biogas tanks, we will ensure that the tanks will enable them to achieve sustainable development," he said. In order to lower the costs of building biogas tanks for local people, he tried to use local cement bricks as the main construction material for biogas tanks, instead of steel molds imported from China. This will allow the size of the tanks to be adjusted according to the number of animals and family members in a given household. Currently, Huang continues to provide training sessions on how to best choose the location of the tanks, as well as on construction techniques, day-to-day management, and the benefits and specifications of biogas and new stoves. As of now, more than 100 islanders have taken part in his training sessions, including civil servants, workers and farmers. 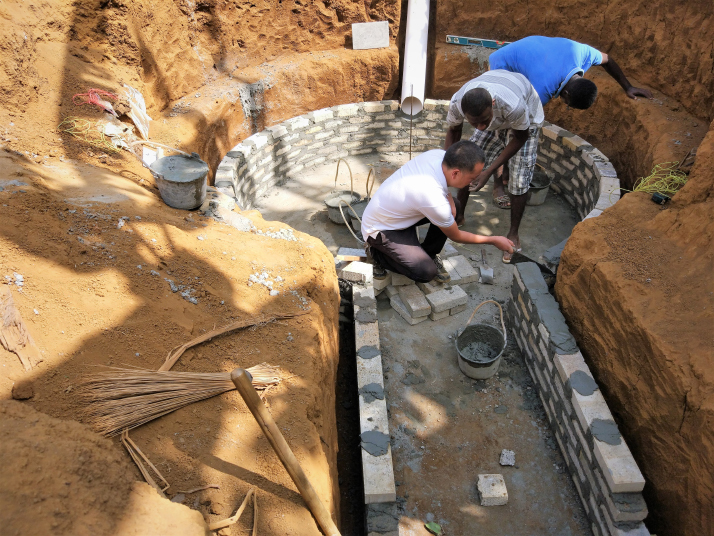 "After taking part in Huang's training sessions, I now know how to build biogas tanks not only by using molds, but also by using cement bricks," said Santo.